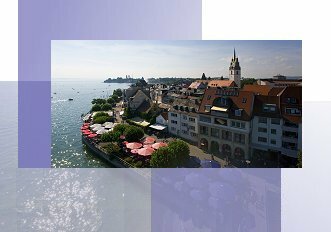 There are few cities that combine economic performance and recreational opportunity like Friedrichshafen. „One need only desire and believe, and then it will be so“, was the maxim of the Count Ferdinand of Zeppelin, a man whose influence has left an indelible mark on the development of the city. It was as a result his work that on 2nd July 1900, Friedrichshafen launched its first airship into the skies, an event which laid the foundations for Lake Constance’s industrial city. Later, during the Second World War, the city specialised in munitions manufacturing and was bombed eleven times before being completely destroyed. Today, the automotive components supplier ZF and the engine manufacturer Tognum/MTU are the driving force behind the local economy alongside a flourishing body of young and innovative middle-sized-firms. Friedrichshafen also excels an exhibition venue, having played host to premiere trade fairs including Eurobike, Outdoor, Aero and Interboot. Home to Zepelling University, Duale Hochschule Baden-Württemberg and numerous private schools, Friedrichshafen is an emerging educational centre, offering a wide prospects for young people amongst the city’s 58,000 residents. Friedrichshafen is home to the longest promenade on the lake, inviting old and young alike to stroll and shop at their leisure. In addition, Lake Constance offers countless sporting and recreational opportunities, from swimming to rowing and surfing to banana boat riding. For those who prefer more alpine pursuits, Friedrichshafen lies a mere stone’s throw from the German, Swiss and Austrian Alps, where hiking, mountain-biking and skiing are all eminently possible. More passive sportsmen and sportswomen can enjoy one of the regular home games of VfB Friedrichshafen, the city’s own volleyball team and Germany’s best. Mobility continues to play a significant role in the Zeppeling city in the twenty-first century, accessible as it is by land, water and, thanks to Bodensee Airport, by air. Since 2001, flights by the Zeppelin NT have become a characteristic feature of the city’s skyline and, along with the Zeppelin and Dornier Museums, are one of Friedrichshafen’s greatest attractions.